The Sultana Education Foundation offers classroom teachers a wide variety of curriculum aids focusing on the history and environment of the Chesapeake Bay. Developed in conjunction with the Maryland State Department of Education (MSDE) and classroom teachers, Sultana’s curriculum materials meet MSDE’s Common Core Standards for science and social studies and can be easily integrated into the classroom setting. Most of the following are available as downloadable PDF files. For hard copies, please contact the Sultana Education Foundation’s office. 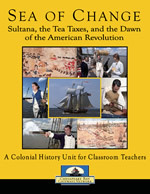 Entitled “Sea of Change: SULTANA, the Tea Taxes, and the Dawn of the American Revolution,” this unit targets students in grades 4 – 6 and examines the world of pre-revolutionary America through the lens of the tax-collecting 1768 British Royal Navy schooner SULTANA. Designed for 4–6 grade students studying the ecosystem of the Chesapeake Bay, this unit contains a variety of readings and creative classroom exercises that will help students better understand the ecology of North America’s largest estuary. 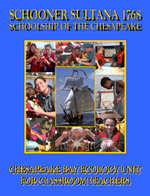 Developed with the assistance of the Chesapeake Bay Trust. Consisting of eight separate lesson plans focusing on John Smith’s 1608 voyage on the Chesapeake Bay, this unit is designed for 4-5 grade students studying the Chesapeake Bay and Native Americans at the time of European Settlement. Developed with the assistance of the Maryland Geographic Alliance and the Maryland State Department of Education. 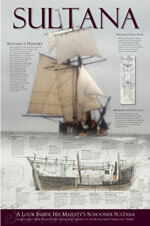 A 20″ x 30″ educational poster detailing the schooner SULTANA’s exploits on the Chesapeake Bay between 1769 and 1771. Developed in conjunction with the National Park Service’s Chesapeake Bay Gateways Network. A set of 40 cards that provide students with details about thirty-two of the schooner SULTANA’s most interesting 18th century crewmembers. 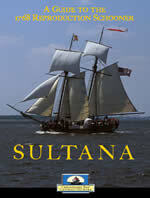 A detailed guide to the history and construction of the 1768 schooner SULTANA. Includes copies of the original 1768 drawings of SULTANA and a listing of all 101 crew members who served aboard the schooner from 1768-1772. Developed in conjunction with the National Park Service’s Chesapeake Bay Gateways Network. A series of visual aids designed to help educators teach students about the Chesapeake Bay ecosystem. Each file is available in PDF format and can be downloaded or projected onto a white board in the classroom.